Some friendly bloggers gleefully pointed out that in the U.S., fruit wine makers actually qualify as wineries. Maybe it is just me, but it might also be the European in me that could only shake his head. Seriously? While I acknowledge that there is wonderful cider out there (aka “apple wine”) – although, at some point someone will have to explain to me how a bottle of cider can cost $20 -, I do not consider that to be a wine really. Same goes for any other type of “fruit wine”. In my world, wine is alcohol made from grapes. Period. The other stuff might be called “wine”, but the producers are definitely not winemakers. They might be farmers or millers or whatever, but not winemakers. So how can fruit wine producers call themselves “Winery”, that hallowed of all terms? Sigh. End of rant. I still don’t get it. But, clearly my one and only Alaskan reader, one of my brothers in law (thanks Weldon! 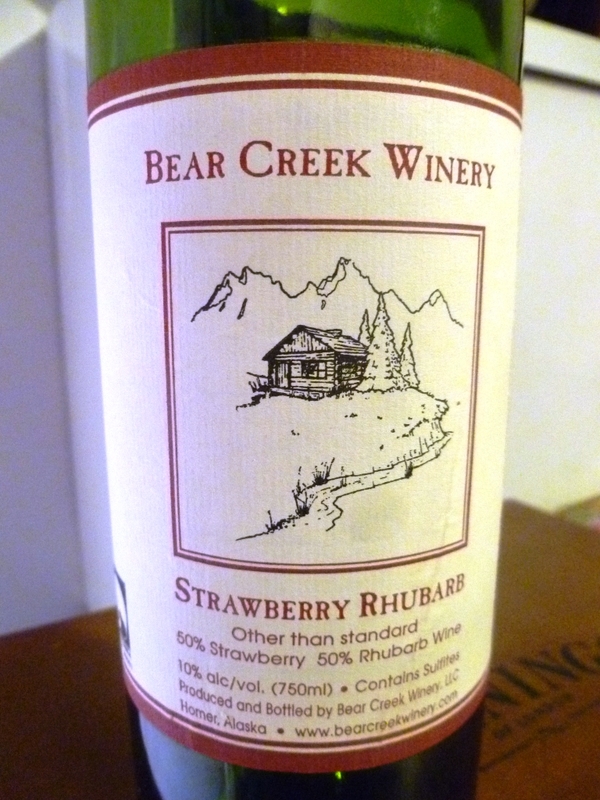 ), was intrigued as well and gave us a bottle of Bear Creek Winery Strawberry Rhubarb wine for Christmas last year. We had a good laugh, and I vowed to try it (reluctantly). And then spring came and went, then summer which we spent in South East Asia, upon our return summer was over way too quickly, and the bottle was still stacked in a wine rack (yes, we do have standards! )…what to do? Would it still be drinkable? So, last Saturday, as I was preparing and heating up Glühwein (aka mulled wine) to make Feuerzangenbowle (literally “fire tongue punch”), a German winter tradition that involves Glühwein, sugar cones, lots of rum and fire (you have to have seen it to understand), Nina decided to throw the bottle in the freezer to chill it down quickly so we could have it before the guests arrived….and in time before I was leaving for Alaska to face my brother in law. So, we tried it. In December. The rather well made label states boldly “Other than standard” and that the wine is made from equal parts strawberry and rhubarb. It is produced in Homer, Alaska (I’ve been there, it’s gorgeous), and has 10% ABV. It poured in a blush wine color and was immediately fruity on the nose (duh). Other than feared, it definitely had not suffered from waiting a year for its consumption. On the palate, it was fruity and fresh, the aromas as were to be expected, but it was neither in any way cloyingly sweet (as I had anticipated) nor boring. The rhubarb seemed to give it a nice acidic punch, and the strawberry was just fun. I have to say that I enjoyed it quite a bit. I can totally see us drinking this in summer on the porch, a nice switch from our obligatory Vinho Verde when we want something less citrussy. We’re now actually talking about acquiring a couple more bottles when we are in Alaska for the holidays. Strike that. I just checked the price list and the Strawberry Rhubarb has a whopping $20 SRP (which makes it one of the cheaper wines on offer from the winery). And that, honestly, is not just a tad too much. Ah well, at least we were considering buying some of it…Who would have thought? Will my mother in law (and my mother, for that matter) stop referring to me as a wine snob? Probably not. But do I have a new found appreciation for fruit wines? For sure. Do I think they’re wines? Nah…. Also, given that I now have tried wines from several states (Alaska, Oregon, Washington, California, Michigan, New York, Texas, and New Mexico – I think New Mexico, not entirely certain), I think I will go on a mission to try wines from every state in the Union. Keep suggestions coming my way. It has undoubtedly become summer here in A2: It is hot, and it is humid…yikes. 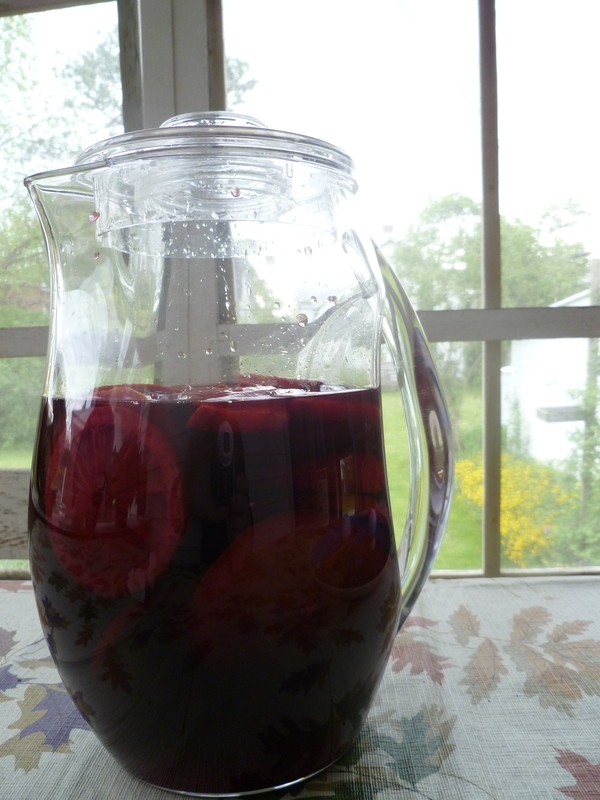 But I have begun feeling my urge to have sangria, and at our local food bloggers meeting we were talking about it, too. So I dug a bit and found my post from May 2012 in which I posted my recipe. 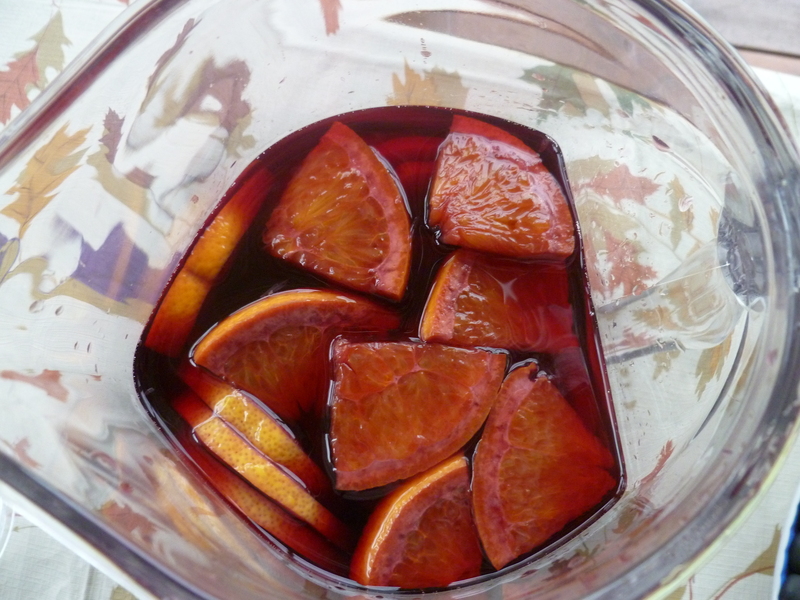 Until then, I had never made sangria. But I thought whatever, it cannot be too hard… So back then, I scoured the web, and found tons of recipes, like this one or that one, usually boasting that they are the best recipe ever. A surprising number were for white sangria of which I had never even heard of before. I was also disturbed by the frequent ingredient of club soda or ginger ale…just did not sound right to me. – 5 liters of Franzia boxed shiraz (hey, it is the world’s most popular wine after all…according to their website) – I picked a shiraz because it tends to be more spicy than the other varieties they have and I thought spice notes like cinnamon and cardamom etc. would go well with the fruit that was going in. Also, don’t even bother with buying more expensive wines, the idea is using a cheap wine and flavor it to taste. – 2 oranges, 1 lemon, 1 apple (all organic, because they will soak with their skins in the wine) cut in wheels. Peaches are also great. – 2 cups of sugar dissolved in 1 1/2 cup of warm water (to create a syrup that blends easier with the wine than the granulated sugar) – make this according to your own taste. A friend of ours also adds some vanilla aroma, which I have found to be a great addition, too. This is not a 5 liter cooler…I refilled it from the bucket.